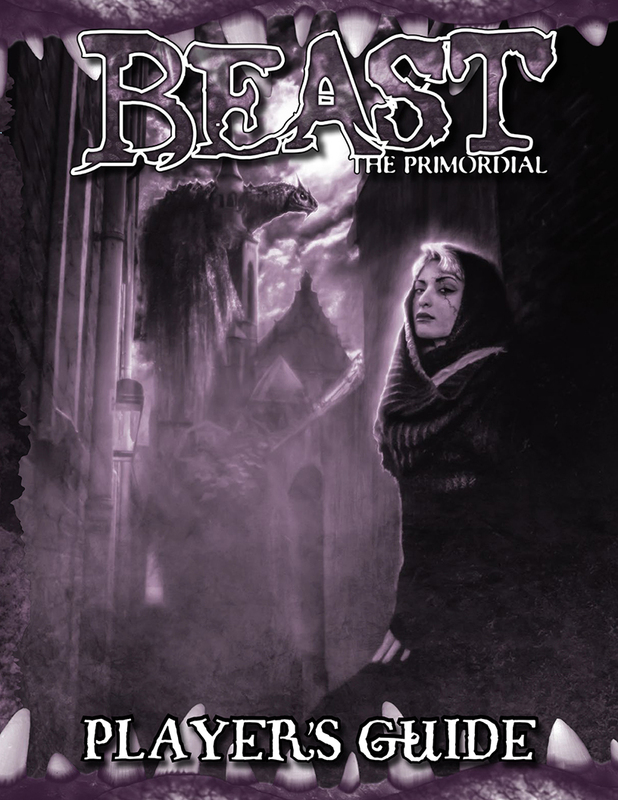 Have a peek at “Eve’s Hoodie,” the introductory fiction from the recently-released Beast Player’s Guide for Beast: The Primordial. Mr. Coffey stepped out of the house. The door was off the hinges and the walls were tagged, but no one came in here. This part of town had homeless just like the rest of it, they stood by the highway entrance with their cardboard signs reading “ANYTHING HELPS” and “HOMELESS VET” and “GOD BLESS” and so on. This place was nice and cool, shaded by some overgrown trees, so why no squatters? Something terrible happened here, thought Mr. Coffey. He smiled at the thought. He knew that a serial killer had once lived here, but that in itself wasn’t interesting; serial killers were a dated fear, a screenwriter’s joke. No, the incident here — and there had been an incident, Mr. Coffey could taste it in the air — had been more recent and stranger. He looked around the yard, lush and green in the wet May weather. The incident was powerful, but at the same time, Mr. Coffey tasted innocence, wonder, the kind of fear that quickened the step and widened the eyes. Children. There was a school nearby, wasn’t there? Mr. Coffey strolled back to his car, and waved cheerfully at the kids riding by on their bikes. He’d probably see them soon. Social worker, he thought. I’ll be a social worker this time. “You should file an AR.” Angel didn’t look angry, just concerned. “Oh.” Dave walked into the room, and Vince stepped back a bit. Dave checked himself; Vince got freaky about personal space. Vince nodded. “Yep, I hear you.” He didn’t look like he was really listening, though. The principal kept glancing at the door as though she expected Richard’s mother to show up. Dave knew better; Richard’s mother — Alyssa — hadn’t shown up for a single parent-teacher conference, and the only way he’d managed to get his IEP signed was to catch her in the parking lot. Ruby, Dave’s aide, smirked at the question and they exchanged a look. Richard kicked a rock into the parking lot. He was hungry. It wasn’t food-hungry, either. It was mean-hungry. The Dead Dog was growling and pacing and wasn’t leaving him alone. Throwing the book and hitting Mr. Luther had helped, but not much, and he felt super bad about it because Mr. Luther was always cool to him. He looked across the street. The line at the ice cream place was already long. He checked his pocket, but only found lint. His lips curled up in a snarl, and he knew the Dead Dog was mad. He wanted ice cream. He wanted to take ice cream from someone, but there were little kids there, and he knew he’d get in trouble if he beat up a little kid for ice cream. He dug his fingernails into his palms. He wasn’t going to walk across the street. Go. The little black girl with the puffy hair. She’s by herself. Take her ice cream and shove her down. “Hey.” He felt a hand on his shoulder. A girl was standing behind him. She was older than Richard, maybe in middle school. She was wearing a gray hoodie with the strings pulled, so he couldn’t see her hair, but he could see her eyes and they were so…deep. She wasn’t a girl. She was a monster. She didn’t have arms and legs, she had tentacles, and they were big enough to crush the whole world. What’s going to happen to Eve and Richard? What does Vince Milliner want? Who is Mr. Coffey? Find out in the Beast Player’s Guide, available now in advance PDF from DriveThruRPG. I’m so very glad to see a new fiction Friday installment. Now I want this book even more! This book is amazing. The fiction in it is also amazing. 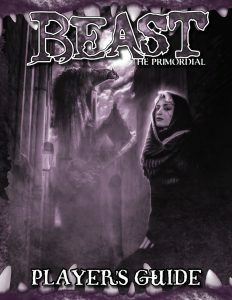 Seriously though, this book right here has opened up our game of Beast so much more and explained things in a more detailed and understandable way that helps my players conceptualize as well as myself when explaining the primordial dream, the other beasts, etc. I’m so glad. That was definitely the intent.